With the new ARU 2400, Kathrein Solutions is launching a RAIN RFID reader on the market that is as easy to install as it is to operate! The ARU 2400 offers new mounting and connection options. The housing of the ARU 2400 can easily be installed in existing shelves using the mounting points for the so-called ITEM profiles. The plugs and sockets are just as easy to operate. For both the power supply and the terminal block of the digital inputs and outputs, a terminal strip with screw terminals – which allow direct cable installation – is installed. Furthermore, the reader has antenna connections in accordance with the FAKRA standard. These antenna connectors known from the automotive industry are robust and vibration-resistant. The coded connectors lock in place with a click and are connected in seconds, which makes installation in large rollout projects considerably easier and also reduces hardware costs. 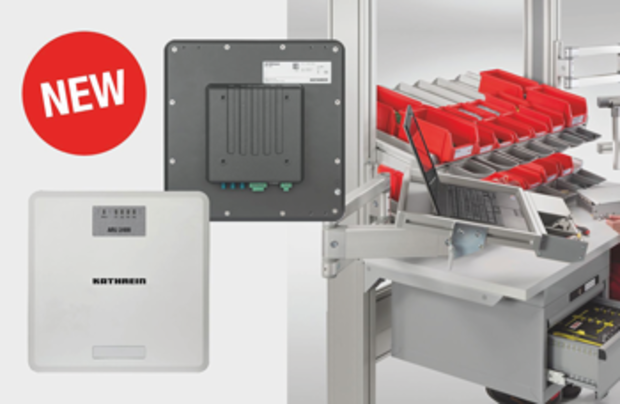 Kathrein enthuses with the ARU 2400 reader with the innovative FAKRA connection technology and relies on the well-known, powerful RAIN RFID front end. This enables a secure reading of RAIN RFID transponders in the range of up to 3 meters. The integrated SMSH HG antenna system with an opening angle of 60°/60° enables extremely selective detection of the transponders in the desired reading field. Furthermore, the reader has the Kathren antenna interface @KRAI at its 3 external antenna terminals to be able to control dynamic and intelligent antennas. This way, depending on power requirements, it is possible to control up to 8 antennas in a cascade per FAKRA port. This reduces costs by up to 40%, particularly in applications with multiple reading points, such as KanBan shelves. Due to the additional position information of the individual antennas, it is easy to locate the load carriers. The built-in digital inputs and outputs enable an easy control of external sensors or actuators. The integrated Linux industrial PC can run independently with applications, such as AccessManager or TagBlower. In this case, no additional application software is required. Due to the built-in PoE interface, which is accessed via a standard RJ45 connector, it is possible to easily integrate the reader into a network. 4 freely programmable LEDs, which are perfectly visible at daylight, enable a customisable visualisation of the individual process steps and informs an employee about the status of the device. The new ARU 2400 is ideally suited for all simple AutoID applications in industry, intralogistics and healthcare areas. Due to its innovative connection and functional concept, the reader meets all requirements for digitisation of the existing production and logistics processes in a cost-effective and flexible way.